A career change at 40 offers the chance to learn new skills and gain wider experience. It can bring the opportunity to work internationally and open previously closed doors. This is a long post, so I’m giving a brief summary here. With my own career change at 40, I have personal experience when writing this article. I spent many years as a recruiter running my own Headhunting business before I changed careers. During the decade I spent working as a recruiter I spoke with thousands of candidates. It gave me the chance to learn about human behavior. I saw what it takes to successfully move jobs and change careers. What will this article give you? Learn why now is the best time in a decade to consider a career change at 40. Read about my own career change at 40 story. How I went from my business collapsing to starting again in a new industry. This time doing something completely different. Discover how I overcame my concerns over my age and the many other worries I had when I changed careers. Get the same advice I gave to candidates when they went through their career changes. The global jobs market is experiencing significant strength. It’s more than recovered from the 2008 to 2009 recession, all industries have showed growth. The Bureau of Labor Statistics gives US numbers shown on the graphic below. 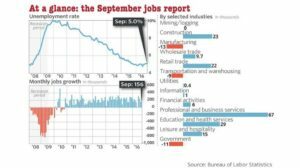 From 2010 up to September 2016 the US experienced a strong jobs markets, with historically low unemployment. From the top left chart we can see that from 2008 through to early 2010, unemployment grew close to 10%. Since 2010, the data shows unemployment in the US steadily falling and then bottoming out from 2015 onwards. The lower left chart of the above graphic shows the average monthly jobs growth by year. The chart below shows this more clearly. The 2008 and 2009 recession had a clear impact. 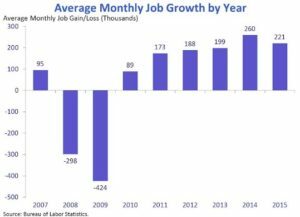 In both years, job growth contracted. Then in 2010 it recovered and has remained robust since. The chart only goes as far as 2015 but you can see a spike in 2014 and remaining healthy since. Are we at the start of rising unemployment or a small bounce before returning to the downward trend? Over the course of 2017 that will become clear. However, based on current data, we can say that the jobs market is strong and similar to pre-recession levels. Employers will recruit with a more open mind during a strong market. In my opinion and based on years of recruiting experience, they will look at resumes from people who don’t fit their “norm”. No doubt the optimism associated with the strong market helps. Such resumes stand a better chance of securing an interview and once you’ve secured the interview half the battle is won. For this reason, for people like us considering a career change at 40, we have an opportunity. The probability of a successful change are now firmly in our favor. In such a good market, the best for many years, it really is the best time to look at a career change. But what exactly constitutes a career change? How Are We Defining a Career Change? Does it involve changing industries? Would it include changing from a lawyer to firefighter or simply an accountant to a manager in an accountancy firm? If it involves retraining and going back to university, is it a career change? The Bureau tells us there is no reliable definition for “career change”. Instead, they give the example of someone promoted from a role carrying out economic research. In their new position this person may still be doing research but the bulk of their work is managing staff. Is this a career change they ask? Another example given is a medical doctor who decides to become a comedian. No doubt, this is a more obvious career change, there are plenty of other examples which are not. As a result of there being no firm definition, attempts to record the numbers of career changers will always be open to criticism. In my opinion, I see a career change as giving a substantial change in the person’s day to day activities. Perhaps it will involve retraining but while I did retrain myself ultimately, I don’t see it as a prerequisite. My own story involves what I see as a career change. In moving from recruitment, I was moving from a sales orientated role to a technical based role in construction. For some people it could mean moving sideways in their company. Above all, whichever definition you use, I’ve seen how peoples’ worries and concerns remain constant. From my experience I know how the stresses and challenges don’t change. We’ll address some of those later. 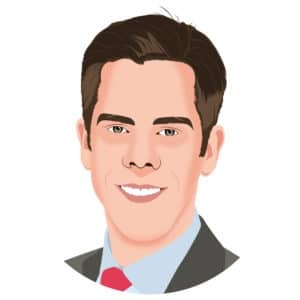 I was going nowhere in my job, I had spent the best part of the previous decade working for myself as a Headhunter in the financial services industry. Ultimately, there wasn’t one thing that prompted my career change at 40 to happen. Partly the uncertainty of working for myself in a volatile market, partly because I wanted something more mentally stimulating. No doubt the 2008 to 2009 recession was a huge driver as well but I’ll get to that in a moment. My pay was 100% commission. I had to find the right people for the position and they had to be happy to take the job. My work had a lot of stress and anxiety. If unsuccessful, I went without pay. All the hires I worked on were Vice President, Director or sometimes Managing Director level. People didn’t frequently change jobs but when they did it often made headlines in the industry press. The whole recruitment process for a hire would take up to 6 months. For the candidate it was often very stressful. For me knowing that my income depended on the person moving jobs, it was also very challenging. When the times were good I was doing anywhere between 6 and 12 hires a year, it was low volume but relatively high pay. During those months of “courtship” between the candidate and my client, their potential new employer, anything could happen. My client could receive a takeover offer or it could even become bankrupt halfway through the hire (yes, that did happen once). Of course, sometimes a candidate would change their mind once they had received the offer from their potential new employer. However, occasionally a candidate would use you and the position you were offering as a tool to get a pay raise. They had no interest in moving in the first place but that came as part of the territory. I took the rough with the smooth. All things considered, it was frustrating and my income was volatile. I could put up with both but as with any sales based job, it was quite one dimensional. The client would want someone for their team and I would find that person, it didn’t get more intellectually challenging than that. At first I enjoyed the process and the simplicity but as I grew older I started to feel I wanted more depth out of my work. Then the credit crisis arrived. It hit me and business hard. The recession was one of the biggest catalysts behind me deciding to take on my career change at 40. The sector I was in saw a lot of redundancies and a lot of restructuring took place. Hiring stopped and a competitive market became extremely difficult to survive in. I was not alone in experiencing this. The big fall in the global economy impacted many recruitment firms. In early 2009, figures from the Office of National Statistics in the UK shows how much the economy contracted during most of 2008 and early 2009. The graphic has data taken over the course of a year from March 2008 onwards. 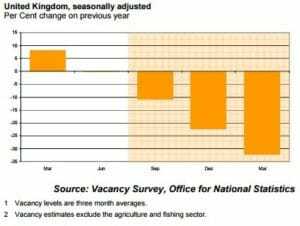 It shows average vacancy levels falling heavily from the fall through to spring 2009. This was the market I was trying to make a living in. With the economy in mess and my business failing I started to ask whether I should face up to the fact that I no longer had a future in the industry. The whole process was very hard to take and I took it very personally. I experienced what Chris Myers wrote about in his Forbes article when their ideas or business fail. Depression. At first, it was a small feeling but over time, the depression got worse. I was in a very difficult position. My wife gave me an ultimatum and I needed to see money coming in. My big problem was that the credit crisis amplified the doubts I had in my mind about my future. I had become disillusioned with the industry and I was not optimistic about the months and years ahead for the market. One evening in early 2012 I bumped into an old friend and we got talking about work, I told him about my situation. He mentioned about someone he knew who had just changed careers. Having spent years as a teacher, he joined the construction industry. What caught my attention was that person was in his mid-40s, a few years older than me. The construction industry was open to his resume and hiring him. I realized there was a chance I could also find a new life and new career in construction. Was I Too Old to Change? At this stage I was still working very hard and desperate to see money coming in but I had no reward for my effort. I wanted change however, I had a nagging feeling that I was too old to consider a career change at 40. Okay, I wasn’t quite 40 but I asked the same question that others have asked, was it too late to change? Liz Ryan‘s perspective to that question is that change is constant. Her book, “Reinvention Roadmap: Break the Rules to Get the Job You Want and Career You Deserve”, available on Amazon or her website is a great resource (I’m not an affiliate). In my case, recruitment was my second career so another career change would be my third. Was it out of the question to change again by the age of 40? I wanted some facts and figures to back up my decision making process. My problem was the same as what I wrote earlier. Since there was no clear definition of what a career change is, there were no numbers available as to how many people took on a change. 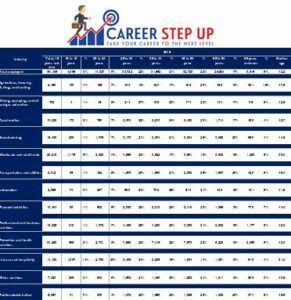 What I found were articles which quoted the same statistic that I read on many other websites, that on average, a person will change their career between 5 and 7 times in their working life. However, with no raw data to support it, I didn’t want to fall into the trap of assuming that because I had seen several articles repeat the statistic, it was therefore a fact. During my research I often came across blogs focused on helping people making the transition from employee to entrepreneur, Rikke Hensen wrote such an article. A longtime friend of mine, Richard Lambert has just done that, you can see his LinkedIn profile here. Without any reliable data on the numbers of career changes, I decided to look at average ages within each industry. Would I be above, below or the same as the average age in my new industry? My concern was that I had left it too late to change but I didn’t know whether this was true or not. If I had more more information about the average ages in different industries I would be better informed. Again, I went to the Bureau of Labor for statistics. I found they had data as recent as 2016 which breaks down the median age of the entire US workforce. The numbers also allowed me to see the median age within each industry. I put the numbers into a spreadsheet shown in the graphic on the left. If you click on it you can see an enlarged version of the same thing. We see the lowest ages in Leisure and hospitality while the highest ages are in the Agriculture, forestry, fishing, and hunting industry. As a quick note. We find the “average” by adding all the values and then dividing by the number of values. This is different to the “median” which is the middle value in a list of numbers. Extreme values can skew the average so the median is a more reliable and useful number. The Bureau of Labor gives data of the the number of workers within each age group. There are seven age groups, 16 to 19, 20 to 24, 25 to 34 and so on. It captures all workers up to and over retirement age. This data can be used to examine each industry and have a thorough understanding of its age group make up. We can see the industry split by the proportions of each category age group. For example it is possible to look at the Manufacturing industry and know that those aged between 35 and 44 make up the majority (21.4%). The remaining is spread across the other age groups. The data in the table shows that our age group, 35 to 44 is the majority in 5 industries. 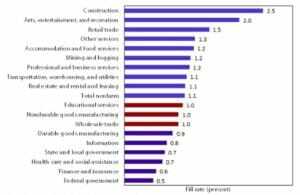 These include Construction (24%) and Manufacturing (21.4%). I’ve reproduced the same data and turned it into an infographic which you can click here to download. What does this data tell us and why is it important? It gives us valuable information about the workers we may end up working with. If we join an industry where our age puts us in the majority, where we work with people of similar ages, our career change at 40 is more likely to be a success. Ultimately, taking on my career change at 40 came down to something far less tangible and much more subjective. That is, if I didn’t change, I would live with the regret for the rest of my life. 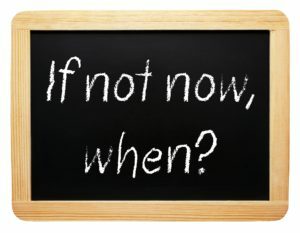 I was fearful that I would spend my time asking myself, “what if?”. I didn’t want to get to the end of my life and look back I should have changed if I wanted a better life. Now, even with the seed of change planted I didn’t know what to do. I took too long to change my career and with no commitment to my existing career it became a huge drag. Many months passed and I did nothing. Sujan Patel wrote an article in inc.com about careers and the top 10 regrets people have. He wrote that a top regret is not quitting quickly enough. In the same way, despite my motivation to change it wasn’t for 2 or 3 years that I actually put things into action. Why I didn’t act sooner is for another article but it was for this reason I did suffer what I tried to avoid – regret. When I was recruiting and working with candidates during their job change I always gave them key pieces of advice. It was the same advice I gave myself when I had my career change at 40. Changing careers is not without stress. The whole process from writing a great resume, to interviewing and then to salary negotiation comes with a lot of pressure. In the middle of this pressure I told candidates to remember why they wanted change and they wanted from it. On the Forbes website, Erika Andersen wrote a very good article about creating the career you want. The sentiment from the article and the approach I took is that ultimately no one else is responsible for our own careers. The buck stops with us. Of course, if need be, we should pragmatic and flexibility but above all, we should be true to ourselves and the terms we set. A career change at 40 begins with the decision to change and starts with the answer to a single question. Why do we want to change? We need crystal clarity about what is driving us. Accordingly, without this clarity, it can be difficult to maintain motivation to see the process through. As a result of this certainty, we become focused on the career we move towards and are able to articulate what we want and what we don’t want. There is a risk that without clarity our careers will drift. We might want to change but what is the catalyst? As a consequence, how can we ensure a career change at 40 does not bring the same problems in a new career? I will soon release an eBook about career changing and the steps we need to follow. For the research I spoke with Sofia living on the East Coast of the US. Originally from Germany, she had was able to speak several languages fluently. She had an advanced degree in languages, working in the training department of a software firm. Her predicament was that she had fallen into her existing role. In trying to move on from it recruiters would invariably focus on her most recent work experience. She expressed to me her frustration and wanted to know how she should direct her efforts better. She was overqualified for what she was doing but unable to move out of the pigeon hole she had fallen into. At the root of her problem was that she didn’t have enough clarity over the direction she wanted to. A career change at 40 requires exactly that. Clarity over what you want and the research to support the process you need to follow to get there. I worked with Sofia to identify her strengths outside of her language skills and we identified a short-list of three types of jobs she should target. Together, we found advertised roles which fit her well and she was interested in applying for. Arguably, for some of us, this approach might be a stretch. We might prefer a more tangible or objective approach. However, the article tells us that even a small acknowledgment of some of the sensations and feelings that arise in ourselves when making decisions can make us better off. Are you Willing to Return to College? In addition to considering which career is suited to our personality, it is worth asking ourselves whether we would consider returning to college. This isn’t education for the sake of accumulating knowledge, it is about advancing our careers for through training. I asked the same question to candidates when they were at a crossroads in their career. Similarly, as part of my career change at 40, I asked whether I needed to return to college and retrain. The cost and commitment I knew would place a high demand on me. However, I also had a long held ambition of securing a Master’s degree. I felt that the degree I achieved in 1997 had become less and less relevant and as a consequence, I wanted to refresh and renew my education. Partly this was as result of my belief in the importance of lifelong learning but in addition, I knew that with more and more graduates entering the workplace, employers’ expectations for even low skilled roles is to demand a degree educated worker. The graphic below shows data taken from the Office for National Statistics over the course of 15 years which supports that. 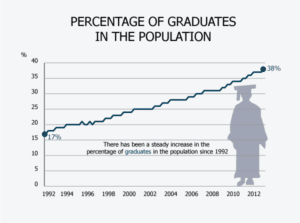 Roughly every 4 years, we can see that the number of graduates in the working population increases by 5%. Therefore, based on the current trend we can estimate that by 2020, people with degrees will make up half of the working population. Universities in the UK are reporting record numbers of students starting university courses. While this benefits the overall population in the long term, it dilutes the value of our existing degree. In the years to come what will it take to stand out? Degrees no longer have the kudos they once had. To set ourselves apart in terms of education we will therefore need to take on some level of further education. One last piece of data worth considering is shown below. The data goes to 2015 so it’s nearly a couple of years old but the principle is the same. 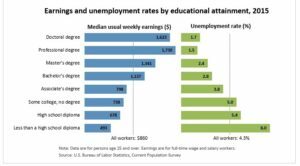 It shows how employment and average earnings levels vary from those with doctoral degrees (PhDs) at one end of the spectrum to those without a high school diploma at the other end. As we might have guessed the better the education, the better your career earnings and employment prospects are. However, what’s surprising is that even to earn the median weekly earning, we need to have at a minimum, a degree. The median level for earning is $860 per week, for those with degrees it’s $1,137. Unemployment rates for the same group is 2.8% while in comparison, for those with a Masters, the rate is less at 2.4%. Their average weekly earning is $1,341. From this data we know that in the early 1990 graduates made up only 15-20% of the overall workplace. While we don’t have the same education, earnings and employment graphic for that period but we should assume they will be reflective of the comparative rarity of degrees and Masters in the work place. As a consequence of the increase in the number of graduates in the workplace, can we project that those with a bachelors will fall below the median weekly earning? To earn above that mark, in the coming years will we need a Masters degree or even more? Less than a generation ago, life long learning wasn’t part of our day to day vocabulary. Not any more. Attitudes have changed, as well as health insurance and pensions, Generation Millennial ask employers what Continual Professional Development (CPD) is on offer before joining. In my opinion, they are our competition and we should be prepared for what will be required of us in the future. The outcome of my career change at 40 project was to change careers and find work and I wanted to put the odds of success firmly in my favor. At this point, I had already spent time looking at the average ages of within various industries. In addition to this, I had researched professional qualification and which were the most “transportable” internationally; I wanted to be able to take my career and work aboard. This effort was going to be coupled with the time I would spend networking, both online and offline in my chosen industry . Through this I wanted to use the connections to help open doors in the industry. However, a final piece of research I did and probably the the most important was I wanted to know how much work was actually available. For this I went to job sites like Monster. By far the most common job type that came up was within the construction sector. It was and still is a growing industry as shown by the numbrer of vacancis being filled. From my own experience of a career change at 40, I found a variety of factors converged towards my final choice of industry, construction. While I had goals for what I wanted out of the rest of my working life, I also had to be pragmatic with what I was capable of. Flying spaceships wasn’t gong to happen and helping some charitable causes, while important to me, wasn’t going to pay my mortgage. I needed be realistic but I also had to be inspired and motivated to change. 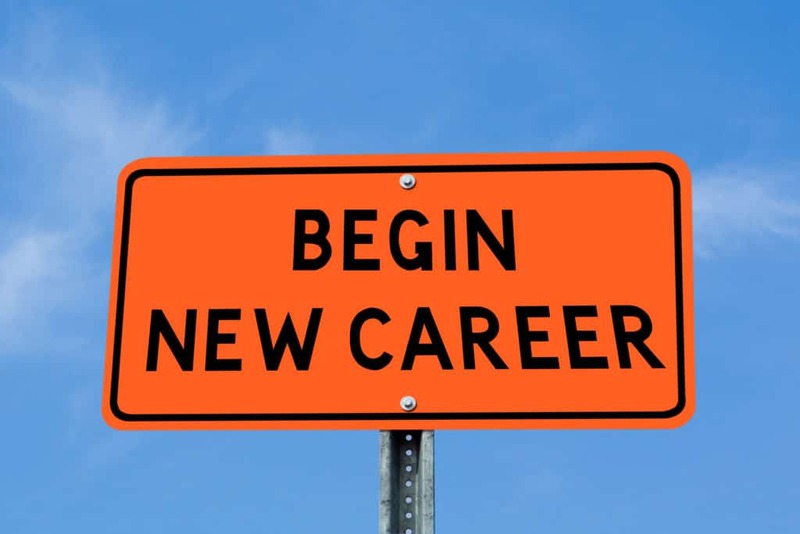 With planning, research and lots of drive it is possible to have your own career change. In my next article I’ll take you through step by step the what you need to do to see it through.